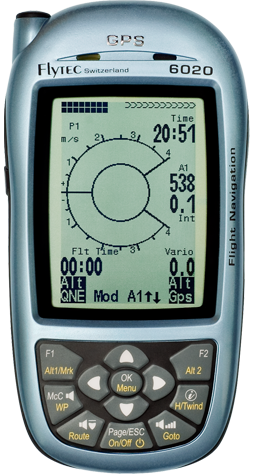 The instrument is fitted with a high-sensitive 20-channel GPS-receiver and provides a plurality of useful information to the experienced pilot. The below featured list is limited to the most important functions and does not consider obvious detail functions which are anyway evident for a flight instrument of this price category. Update rate: 1 second, independent from preset recording rate. Competition-Route: cylinder circumference adjustable from 20 m up to 200 km/h, ENTRY- or EXIT Start-Cylinder, up to 5 start gates, adjustable in 5-minutes interval. Memorizing up to 150 Restricted Areas each with up to 100 polygon corner points, circles, segments or mixed. 3 display fields per page, resulting for 3 pages in total in 9 displays to be freely defined. In addition also for the final approach calculation again 3 pages with 3 display fields.